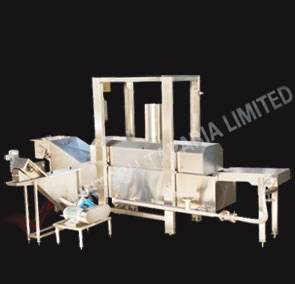 Exclusive tortilla chips fryers for optimum product quality assistance on a complete turnkey project incorporating all the required equipment in the line. Capacity starting at 100kg/hr. We offer Turn-key installation along with process know-how and technical support for the project to produce Frozen French Fry. It includes process line, refrigeration system, freezer and building storage for frozen products. Advanced high-performance Multi-Flow Frying Systems with precision process controls; Multi flow maintains constant oil temperature on entire fryer length and results in more consistent finished product quality compared to single-flow fryers.